Collecting, Restoring & Selling » Happy Fourth of July 2009!! Happy Fourth of July 2009!! It seems that time is passing so quickly! I have neglected my viewers and the blog by infrequent postings on this blog site. I have been promising myself to get busy with some updated postings. So I’ll start things off with a celebration of our Nation with this patriotic view of three pieces of Americana—Western Electric Model 500 desk telephones. I’ve also been tossing around some ideas for some future articles. Meanwhile I’ve been busy refurbishing a phone here and there, have picked up a few for my own collection and spent some time working on those. Summers are short here in Michigan so now that the snow has melted and the grass is green again there are many things to do outside! Someone recently told me that there are two seasons in Michigan—–Winter and July. Well actually it’s Winter and July & August! In addition to all of my other obligations I have been busy over at Classic Rotary Phones posting on the forum that we started there last fall. If you get a minute drop by the forum. It is a great place to talk about phones and phone related topics. It’s very informal and no question is too simple or unimportant. So if you have a question or many questions someone will be able to help you or direct you to someone else that can. I always urge new telephone collectors, or those interested in becoming a collector of Vintage Rotary Phones to join one or both of the telephone clubs. 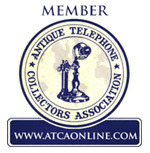 The Antique Telephone Collectors Association and the Telephone Collector’s International have hundreds of members with many many years of experience who are always willing to share their knowledge. 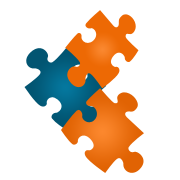 There are many benefits to membership in each of these organizations. I am a member of both clubs. I have met many fine telephone collectors and learned much from them. So today I will leave you with a photo I took a few months ago on President’s Day. A small piece of Americana are these beautiful Western Electric Model 500 telephones. Red, White and Mediterranean Blue. This is a photo that I have posted on the forum so my apologies to those of you that have seen it already. I hope wherever you are that you enjoy this day, a day of celebration and remembrance on this, the two hundred and thirty-third anniversary of the United States of America. A day that I hold dear and a day that I continue to be thankful for all of those that have served, sacrificed and continue to serve so that I can live in the greatest Country on the planet! Just checking back into your sight. 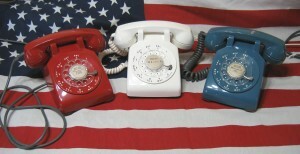 I love the 4th of July picture you posted of the different colors of vintage 500 phones. My husband and are still thrilled with our vintage model 302 phone. We never turn our “modern” ringers on, so we can hear those clear brass bells. When the phone rings, it’s just a step back in time. Hi Karen, good to hear from you. It’s always good to hear that the phones are still working good. I’m thrilled that all is well and that you and your husband are enjoying your phone so much. Thanks for the compliment on the photo and thank you for stopping in to visit!